Have questions about our exogenous ketone supplement, PRIME? Learn all there is to know about our patented blend! Kegenix™ PRIME™ is a mineral ketone supplement with its own proprietary blend using a patented technology. We own the exclusive worldwide rights for the patented technology developed from an approved patent invented by Dominic D’Agostino at the University of South Florida. How much BHB is in one serving of PRIME™ ? We have a proprietary blend of 10 grams of BHB Quad Salts and MCT per scoop, formulated to deliver what we believe is the equivalent of 13gm of just BHB salts. So there is a total of 20 grams of our BHB Quad Salts and MCT patented combination. How long will it take for my body to get in the state of ketosis after finishing PRIME? Your body will get into the Fat Buring Mode (ketosis) anywhere from 30-minutes to an hour! How fast should I consume PRIME? We recommend to consume PRIME within 30-45 minutes after your initial sip! Does Kegenix PRIME contain caffeine? While our previous formulation of Kegenix PRIME™ had caffeine, our newest formulation does not! If you prefer caffeine, we are currently in the process of developing a version of Kegenix Prime that does include caffeine! This way our customers have a choice of their preferred Kegenix PRIME™ formulation. When is the best time to take PRIME™ ? We recommend to take one scoop/packet in the morning followed by the other scoop/serving in the afternoon. Since PRIME is very versatile you can also take PRIME 1/2 hour before and/or after the gym or any type of endurance training. 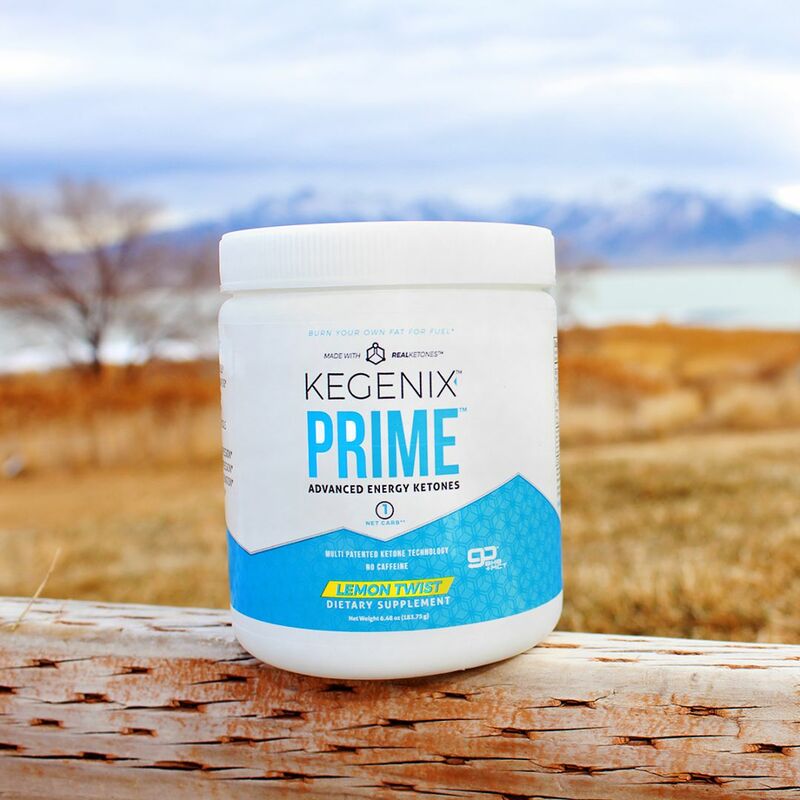 For optimal performance, we recommend taking Kegenix PRIME as both, a pre & postwork drink! How Kegenix PRIME™ works to keep you in ketosis? Kegenix PRIME™ is the first ketone supplement designed to provide CKS (Continuous Ketone Supplementation) to help your body sustain its beneficial ketone levels for consistent mitochondrial energy production. Kegenix PRIME™ ’s multi-patented, proprietary, combination ketone formula allows for a unique phased ketone delivery process to assist in ketone and electrolyte absorption without interfering with the body’s own ketone production process. We believe one of the keys to achieving greater benefits from ketones is to provide the right ketone ratios to the blood and hepatic system in maintaining beneficial ketone levels. What kind of diet should I follow when taking KEGENIX™ ? You can select whatever diet you want when taking KegenixTM. It all depends on what your personal goals are and how you want to benefit from adding ketones to your nutrition. If you want to lose weight, then you will want to adopt a LCD/VLCD. If you want to run a dual fuel system, you need to balance that with carbohydrates for maximum performance. Kegenix was developed as “weight loss science for every body” and it’s up to you to decide how you would like to benefit. Can I take PRIME and Keto Meal in the same day? Yes you can! We recently conducted a Clinical Consumer Study and the results are incredible! To see those results, click here! Should I drink PRIME on an empty stomach? It all depends on how your body is! Sometimes people have GI issues after taking in on an empty stomach, if that happens we recommend to eat saturated fat a half an hour before drinking Kegenix. What do you use to sweeten PRIME? We use the non-bitter portion of the stevia leaf to sweeten PRIME (and meal), which reads on the ingredients listed on the back as rebaudioside A. What is the difference between the PRIME canister vs the PRIME packets? There is no difference. We have the packets available for ones' convenience, specifically for people on-the-go! What is the difference between PRIME and Keto Meal? PRIME is engineered to put someone in ketosis in 30 to 60 minutes. PRIME is our ketone supplement that can be used for all kinds of purposes that elevating ketone levels can be used. Keto Meal is engineered using real ketones provide people a complete meal replacement including the protein, fat, ketones, fiber and vitamin/minerals in a Keto balanced ratio. Can I take Kegenix™ while pregnant? Can I mix Kegenix PRIME with substances other than water? YES! PRIME is very versatile- we've created recipes for some of our favorite combinations and published them to our website! Below are some of our most popular, but feel free to explore and create some of your own! Prime Palmer🏌️- Hit a hole-in-one with this spin on our favorite summer drink! Lemon-Lime Keto Slushie 🍹- It's sweet, yet tart, cold, and so refreshing. Who needs a Slurpee, right? Keto Orange Creamsicle Smoothie 🍊- This summer will be a dream with our version of the classic orange creamsicle! Click here to order PRIME while supplies last!